One of the coolest thing about this run is that it was against a brand spankin new 2014 Subaru STI limited edition. It was a BEATUIFUL car but was no match for the HHR. Thanks for playin along guys. This just goes to show 1/8 to 1/4 mile calculators can be VERY inaccurate. 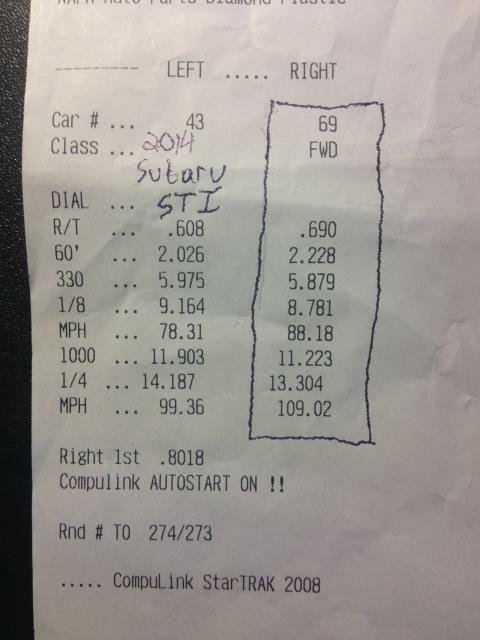 One of my runs was a 13.5 @ 109 with a 2.3 60ft and even that time proves 1/8 to 1/4 mile calculator to be off by a lot. 13.08, by lowering tire pressures all day, & doing beautiful smokey burnouts. 15lbs of tire pressure, got me the 13.08, & killed the MPH, from 110 down to 104.
which resulted in a best of 12.86. XtremeSS, thanks for the Stickers Bud! Now I am going to have to get a Drop-In K&N Filter/Assy, and some TTR Parts! Lol. The k&n filter is a good idea and technically, the TTR sticker IS a TTR product so your good to go!